For 30 years, Action Communications has helped business, government and schools improve the quality of their employee communications. Our experience with all types of equipment and computer technologies, and our engineering design skills, allows customers to tailor their two-way communications, dispatching, paging and data transfer to their specific needs. We have designed, installed and maintained numerous fixed and mobile operations using various transmission systems including multiplexing, repeater, trunking, mobile data terminal and microwave systems. Our work has included the development of wireless local networks for the transportation, government, aviation, public utility, agribusiness, engineering, security and construction sectors. Because of our experience in system design and diagnostics, we are one of the few dealers in the United States used by manufacturers worldwide to evaluate their modifications and new equipment before commercial release. System Design: We take pride in our ability to customize any system. Since we are not affiliated with a single manufacturer, we can tailor equipment capabilities and pricing to meet customer circumstances. Our systems include two-way radio, dispatching, mobile data terminal, repeaters, voice inscription/scrambling, 450Mhz trunking, as well as our own 450Mhz Passport wide area system and 800 megahertz trunking capabilities. Our designs often allow for future expansion of even the smallest system. Installation: We take full responsibility for guaranteeing the performance of all the equipment we sell, design or modify. 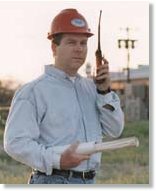 We use our own technicians for all installations, including tower construction, computer programming and individual radio systems. We personally test every piece of equipment we sell prior to installation, even if the equipment is new from the manufacturer. Technical Support and Service: Ninety-five percent of all warranty and non-warranty service we encounter is done by our technicians in the field or in our shop, rather than returning equipment to the manufacturer. We are factory-authorized to service all the brands we handle. We are specialists in the maintenance of repeater systems, including the complicated task of tuning antenna duplexer systems. In 1985, we were selected as the exclusive local dealer for Zetron repeater equipment. No other local dealer or manufacturer offers as extensive a technical support service. We also stock the largest inventory of radios, accessories and spare parts in southern Arizona, giving our customers the most responsive and reliable installation and repair service available. Licensing: We assist our customers in obtaining frequencies and licenses. We also provide license-free private communications where appropriate. Equipment Rental: Short and long-term rentals of all our equipment is available. We have the largest supply of hand-held radios locally and are used extensively by event promoters, motion picture production companies and special services such as security.